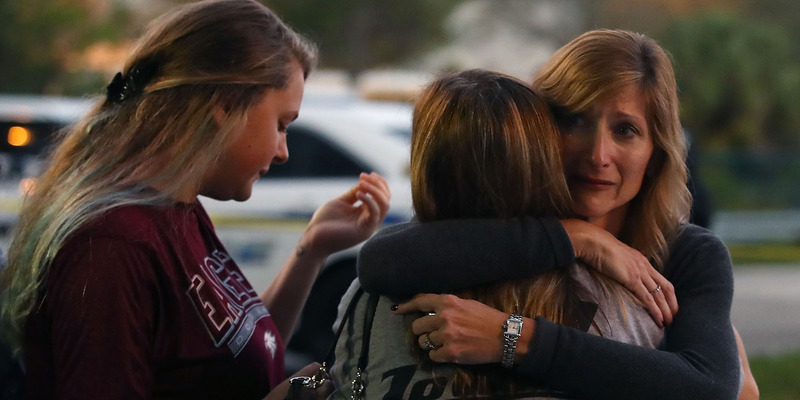 There are a number of ways you can help the victims of the Parkland, Florida school shooting. You can donate blood locally or from around the country. You can donate money through local charities or the official GoFundMe page for the victims of the shooting. Authorities have urged individuals to report anything suspicious they might notice to local police or the FBI’s official tip line for incidents related to the shooting. The massacre at Marjory Stoneman Douglas High School on Wednesday left 17 people dead and another 14 injured. Three people remain in critical condition, according to CNN, and dozens of families are still reeling with shock, disbelief, and grief from Wednesday’s tragedy in Parkland, Florida. There are ways people all over the country and the world can help. For those in Broward Country and South Florida, the Broward Sheriff’s department has announced that it will be holding a blood drive in Hollywood on Thursday to help individuals still receiving medical care for their injuries. “There will be a blood drive to help victims of the #stonemanshooting at Cox Media, 2741 N 29th Ave. in Hollywood from 12-7,” the sheriff’s department tweeted. Other blood banks in Parkland itself will also be holding drives, and authorities have requested that people with Type O-negative blood come forward to donate. If you are not in the Broward County area, there are still ways you can donate blood. You can locate a center where you can give blood near you by typing your zip code into the Red Cross’s blood donation search engine. A GoFundMe account has also been set up to aid the families of the victims. The account says funds will go to the affected, and it has been deemed credible by Florida’s Attorney General Pam Bondi. “Donations raised here will be used to provide relief and financial support to the victims and families of the horrific shooting,” the GoFundMe page reads. More than $US94,000 has already been raised on the website. Several organisations have partnered with groups like Public Good to direct people toward verified, trustworthy charities. Individuals who need emotional or psychological help should be referred to counseling and mental health services in the area. Authorities such as Broward County Sheriff Scott Israel have urged people to report suspicious activity or unusual behaviour that they believe might be a precursor to violence. You can report anything concerning to the FBI on their official tip line for the Parkland shooting.